I imagine that this is what a homesick American would eat if visiting a good friend in India over thanksgiving: dal textures and ingredients, but pumpkin flavors and spices. It has some wordy steps, so read through first, and the timing and development of the dish will seem perfectly natural. 1. Put a large pot with 6 cups of water on to boil and cover. 2. While waiting for the water, get out a saute pan, veggie oil, 1/2 cup dal, cutting board, large knife, at least half of a sugar pumpkin (approx. 6" wide), 1 large or 2 small parsnips, turmeric and salt. Carefully cut the pumpkin in half by inserting the tip of your knife, then push the blade in to the hilt, and pull the handle down. If needed, pull out your knife and insert farther down, do not try to saw through, it's unsafe. Scoop out the seeds with a spoon and set aside to toast with Braggs later if you like. One half you can cover with saran wrap on a plate for all your other great (but not as good) pumpkin recipes. Peel the remaining half and cut in half again, so you have two quarters. Dice one of the quarters into rough 1/2" cubes. Peel the parsnip(s) and dice likewise. Next put the saute pan over medium heat. While it's warming, chop the remaining quarter of pumpkin into rough 2" cubes and set aside. Pour about a tblsp of oil into the saute pan. While it's heating, dump the small pumpkin cubes and parsnip into the boiling water with a half a tsp. each of the turmeric and salt. Finally, saute the dal in the hot oil for 2-3 minutes, careful not to let them burn, then stir them into the pot with the pumpkin and parsnips. 3. Next, get out a large microwaveable mixing bowl, flour, cumin (optional), and 1/3 cup warm water. Make sure there's a clean spot on the counter for rolling out the plumplings in a minute. In the bowl, mix 3/4 cup of flour, 1 tblsp of oil, 1/2 tsp of cumin, and 1/2 tsp of salt. Continue to mix while slowly adding the water (may not need all of it) until the dough attains a satiny texture. That's half-way between tacky and crumbly. You'll end up using between 1/4 - 1/3 cup of water. Now dependent upon your level of ambition, use the entire ball of dough, or a quarter at a time, and roll it out into long snake like you used to do with playdo as a kid, 'til it's a little more than 1/2" in diameter. Using your thumb and forefinger, pinch off inch-long sections of the dough so the pieces look like a cross between gnocchi and orecchiette. Set those aside while you rinse out the bowl. Using the bowl, microwave the large pumpkin cubes for 4 minutes on high. Now's a good time to stir the dal and wipe down the counter. 4. Next, get out a fork, coriander, ground ginger (if you only have fresh, grate or finely chop 1/2"), and cardamom. The microwave should be done by now, so sprinkle 1 tsp of coriander, 1/2 tsp of ginger, and 1/2 tsp cardamom on the pumpkin and smush it up with the fork. 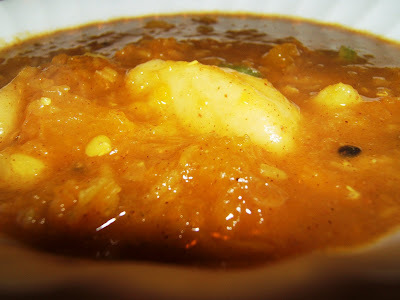 Stir the pumpkin mash and the dumplings into the dal, and be sure to occasionally stir getting everything in the bottom mixed up until the dal is cooked. This should take about another 15 minutes, but it depends on your consistency preference. Some people like it soupy, some like it pasty. Regardless, the next step should happen when you're 5 minutes away from considering it "cooked." 5. Turn the heat to medium under the saute pan and add another tablespoon of oil for tempering the spices. While it's heating, get out a stick of cinnamon, a 4"-long chili (preferably a skinny red Thai chili), ground cinnamon, ground clove (if using whole, you need 2 and careful dinner guests), lemon juice (or half a lemon), and 8 medium or 10 small fresh sage leaves (if only have ground sage, use 1 tsp). The oil should be hot, so toss in the cinnamon stick and while it's spluttering (that's the technical term), slice the chili in half. Mix both chili halves in and while it's spluttering, wash your hands. Then toss in the cinnamon and clove and while it's spluttering, mince the fresh sage. Mix in the sage and splash in the lemon juice. Finally stir the whole spluttery mixture into the dal, and let the flavors meld for 2-3 minutes while you wash up and set the table. Can the author of this recipe, please tell me how much ground cinnamon & lemon juice to add in the final step? I want to make this for supper TONIGHT & would like the measurements you use. Sorry I didn't reply yesterday! How'd it go? The cinnamon is 1 tsp and the lemon is a hearty tblsp.